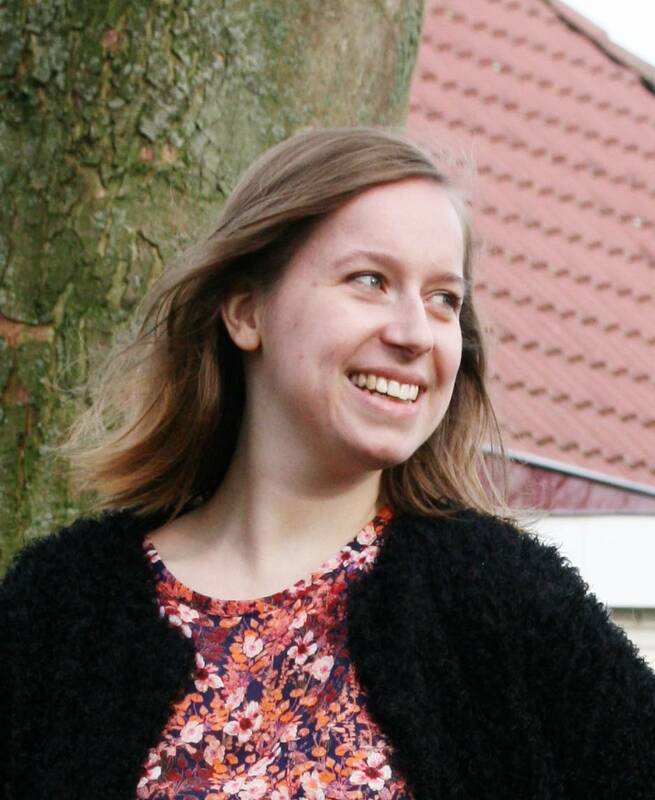 Let me just state that I wouldn't have gone to Almere with my mother, if I didn't get so many H & M giftcards. Which I certainly didn't mind of course. I might have bought only sale items last time, but this time I bought items from the new spring collection as well. This super adorable cute crop top with Peter Pan collar was 7 euros at Primark. It wasn't busy, which is amazing. It's so much fun to shop there when you have some space. 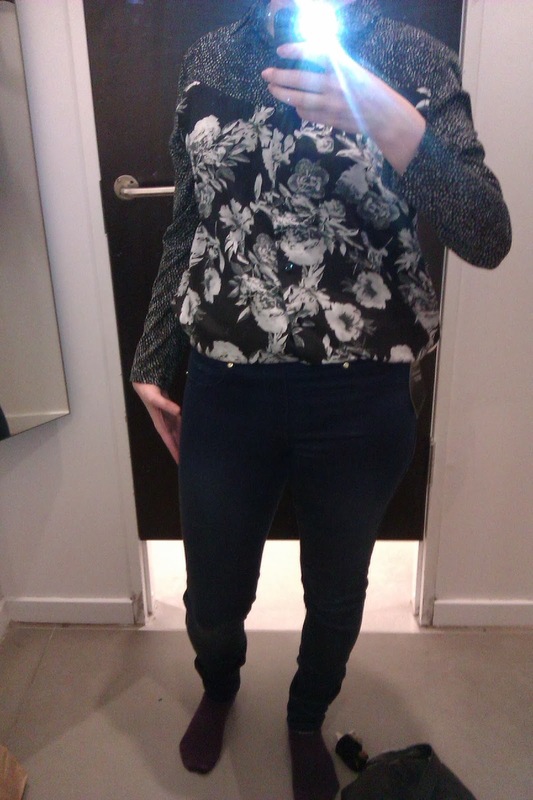 This blouse from Primark is really cute as well. It's quite long, but tucked in your pants it looks great. It looks great without being tucked in as well. It was 10 euros. In my opinion totally worth it! Only 7 euros. The red blouse looks a little bit like an other blouse I have (hasn't appeared on my blog as of yet). 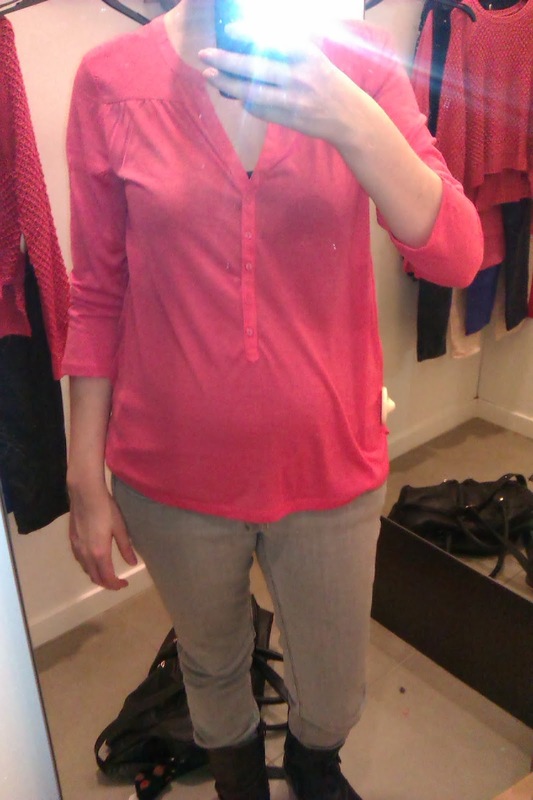 But this one has no sleeves, is a slightly other color and the other blouse doesn't have any ruffles. I really love the color and I think it looks great combined with the polkadot pants. And that brings me to the next picture: the blue polkadot pants. I saw them and immediately was in love with them. I knew I had to try it on and so I did. 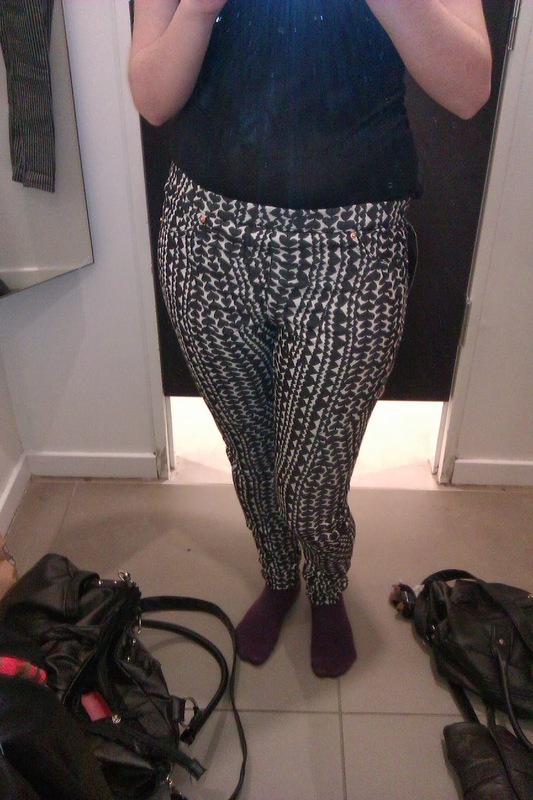 I was so happy it fits to a T. I wouldn't have bought polkadot pants a few years ago. Now I can't wait to wear them! 17 euros at Primark. Next stop: H & M. All these giftcards needed to be spend right? I wasn't planning on it. I just wanted to look at the last sale items and maybe try on some things from the new collection. This one, for example is from the spring collection. 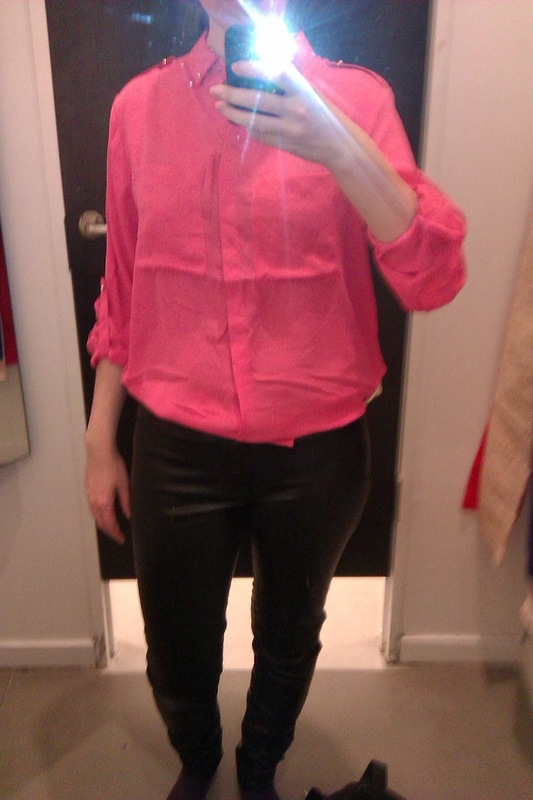 This pink crop top was 19,95 euros at H & M. I love the color and immediately wanted to try it on. I'm glad I bought it, though I'm slightly fearful of the top. How long with it last? Since I think the fabric might rip easily. And I'm kind of a klutz. Hope it won't rip though! 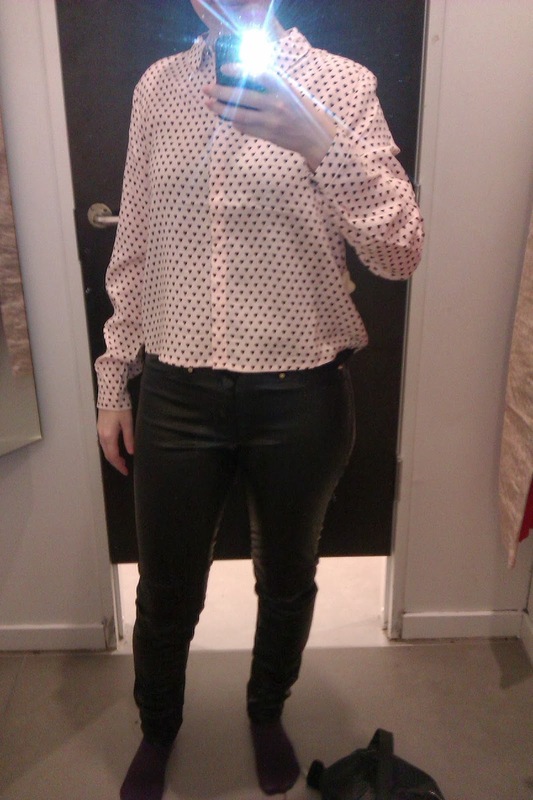 I also bought this fake leather pants at H & M for 29,95 euros. Just like the polkadot pants, this wouldn't be an item I would've worn last year. Though at nearly the end of the year I was considering it and tried one (it was too tight). Can't wait to wear it! I'm crawling out of my comfort zone and liking it. Though I don't just buy things just because they're not my style. I really do like it and just like to experiment with fashion. Fashion is always evolving and my style is changing too. But I still love my jeans combined with a sweater. My mother saw an adorable scarf at Primark, but I already have so many scarves I didn't buy it. So I bought this one instead haha! This scarf from the H & M was 5 euros, it was on sale and originally 9,95 euros. It goes great with my New Yorker coat and I like the fact that the scarves has two different prints. So basically you have two scarves for the price of one. If you want to do it right, you should. 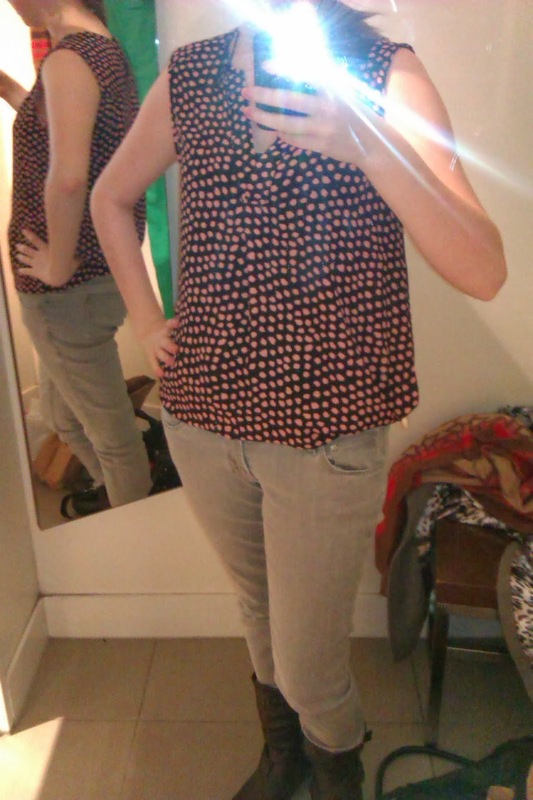 Thus, another polkadot pants! In my defense, this one might be a tad easier to combine since it's black. Plus, these technically aren't pants. They're treggings. And if wouldn't have bought it, it might have regretted it. 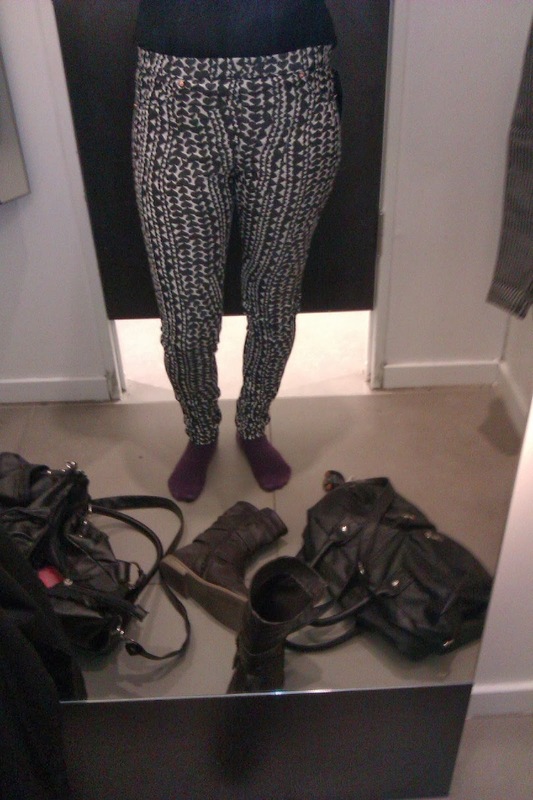 It was 14,95 euros at H & M.
I know, I know. But I wear my tregging all the time and I was saying over and over I wanted to buy another one, since it was so darn comfy! Might as well buy another one and use that giftcard right? 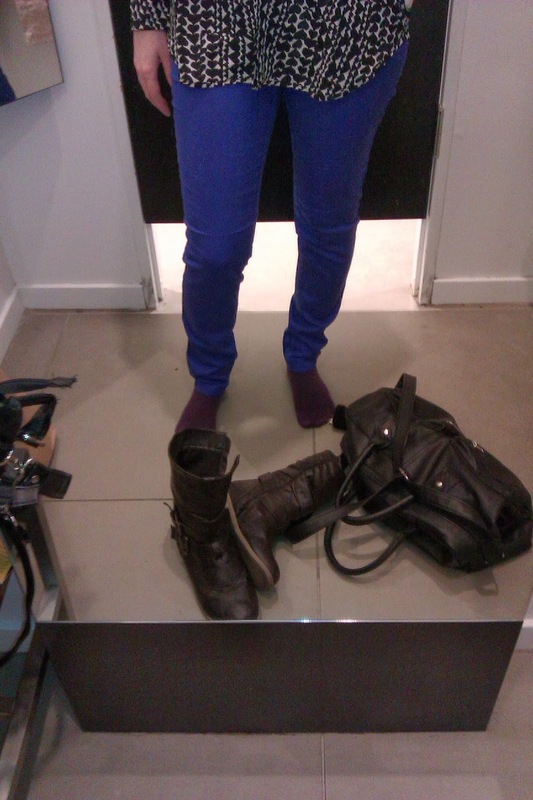 14,95 euros at H & M.
I think I have enough colored jeans at the moment. This green jeans were only 3 euros and are from the Divided collection from H & M. Used to be 19,95 euros. 3 euros, just like the green jeans above. Do I even need to add? The color of the jeans in real life look like the second picture. 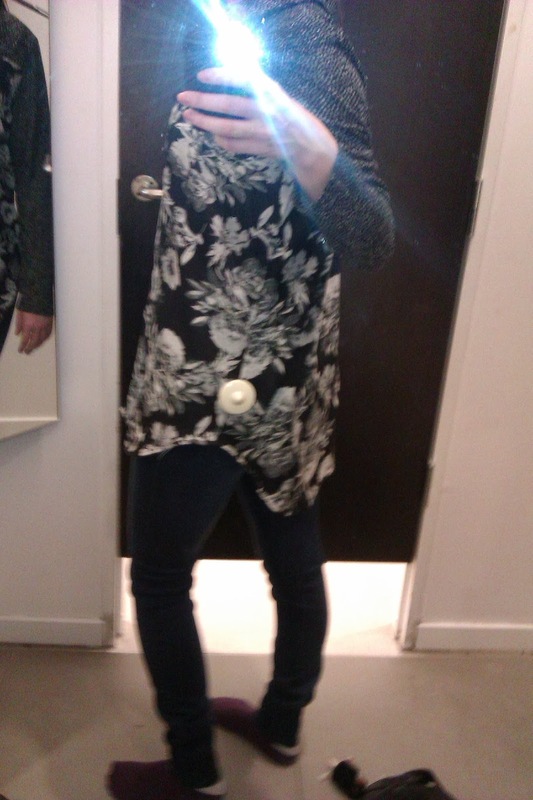 And now the things I tried on, but didn't buy. 9,95 euros at H & M. I already own it in red and thought for just once I don't need this one (do I really love the color). 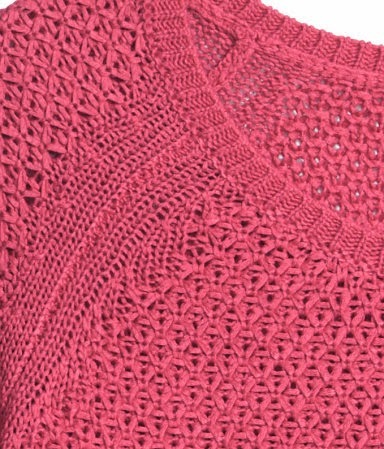 19,95 euros at H & M. Such a pretty color but it was so freaking long. 19,95 euros at H & M and too cute for words. 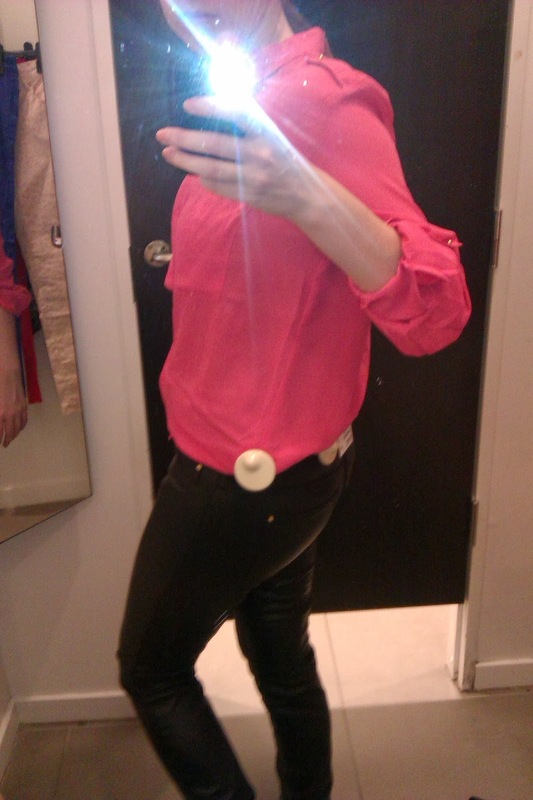 I had to squeeze my arse into these jeans. I could barely breathe. It was a sale item, but there wasn't a size bigger. Don't remember the price. This blouse with hearts was really long. 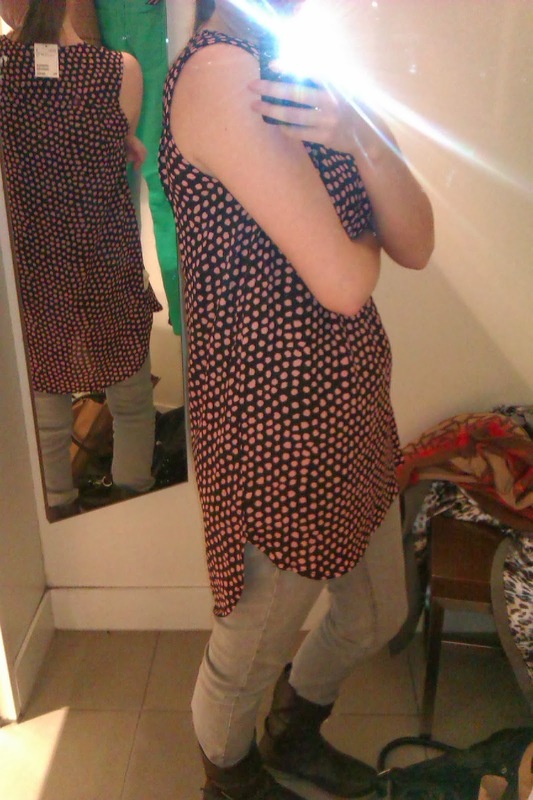 14,95 euros at H & M.
Likewise. 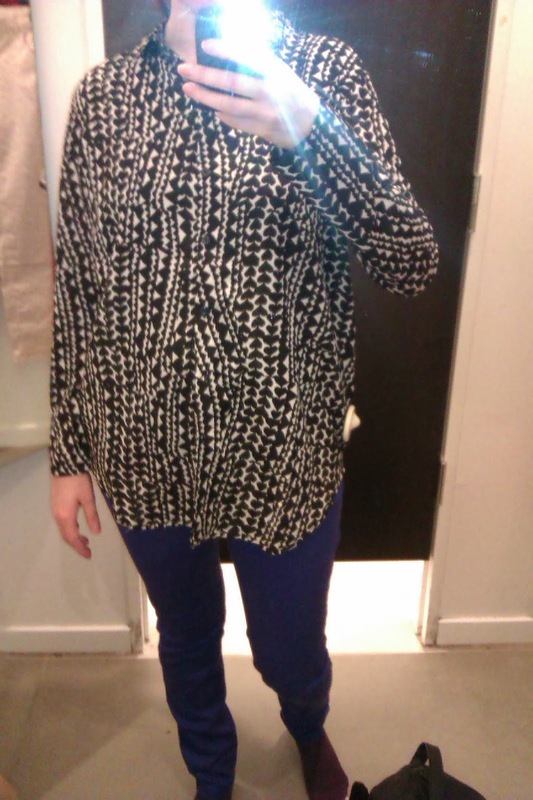 Also 14,95 euros at H & M.
This tregging was not exactly flattering. 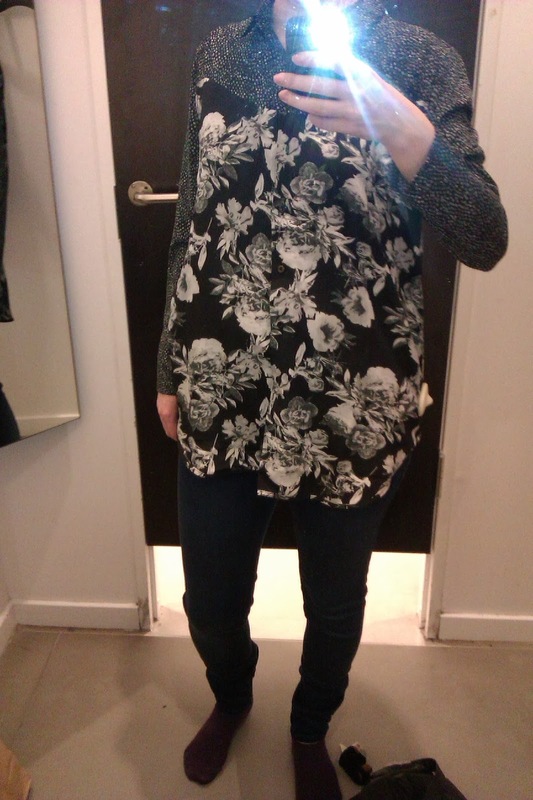 14,95 euros at H & M. It didnt help either that it was freaking tight. Too short for a dress, too long for a blouse. Only 14,95 euros and I wish it was shorter. 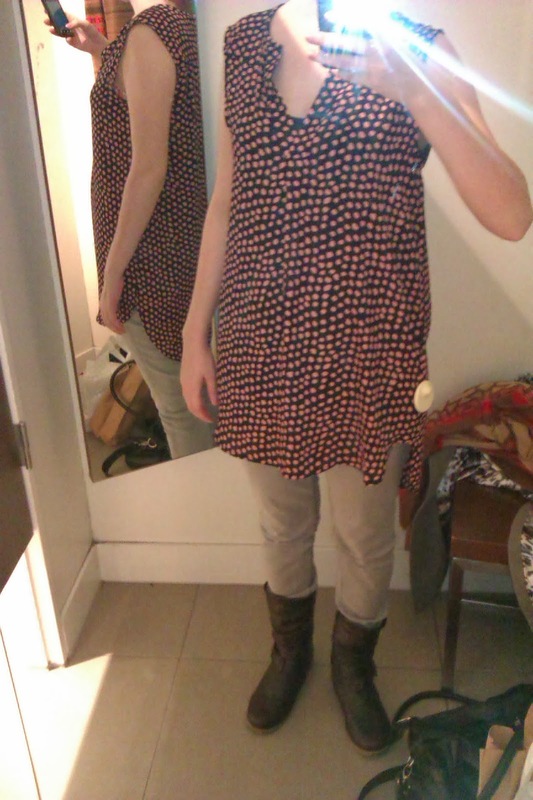 It might look good tucked in, but if I want to buy it I want to be able to wear it without tucking it in my jeans. Thank you so much for your lovely comment :)! great picks! :) the red blouse is so chic! 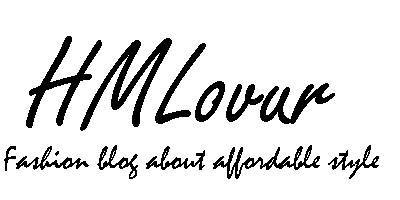 I love the items you actually purchased, a lot of trendy staples! Thank you so much, quite happy with them myself!